Is Rare's Sea of Thieves Further Away Than We Thought? Is Rare’s Sea of Thieves Further Away Than We Thought? Among the few upcoming first-party titles announced by Microsoft Game Studios, Rare’s Sea of Thieves is without a doubt the most promising one. The unique blend of Rare’s signature art style with an online, shared world based on the pirate fantasy was more than enough to entice beforehand, but we were even more intrigued after playing Sea of Thieves at Gamescom 2016. However, there is one legitimate concern at this point and that is when folks will be able to play this game. During E3 2016, Microsoft’s Head of Xbox Marketing Aaron Greenberg said that Sea of Thieves would ship in the same window of Halo Wars 2, which was scheduled for February and effectively launched that month. We’re nearing the end of April, though, and the latest developer update posted in the Insider Programme forums four days ago seems to suggest that Sea of Thieves is far from being completed. Design Director Mike Chapman focused on the importance that NPCs will eventually have in bringing the world of Sea of Thieves to life, but his words also imply that it will be a while yet before this happens. We’re currently building out the larger systems at the moment, or painting the broader strokes as it were. We’ll bring an added attention to detail to our NPCs in time. At the moment in our Technical Alpha, we’ve implemented the first skeletons in the game as an example of an AI threat, and while we’ve said that more kinds of AI threats are coming in the future, we’ve not talked about how these will be linked to Voyages. While the world itself will emergently provide AI threats to the player, the types of Voyages crews embark on, as well as a Voyage’s potential value, will ultimately affect the types and difficulty of PVE threats that they may face. We know very well that we can’t solely rely on players to create interest in the world, which is why Voyages and how they link to PVE elements will be so important. Skeletons as the first example of an AI threat felt appropriate because of the contrast when compared to real players. In the future, we intend to add new threats as well as build on what skeletons can do and the types of objectives they can provide beyond just impeding progress on islands. When we talk about delivering a fantastical world of pirates, this is inclusive of both using players as part of PVP encounters at sea, but also using PVE elements to enrich that world. Thinking of pirate movies and literature, they often touch on more than just sea battles and the adventures for lost treasure, they also feature daring raids on forts, overcoming treacherous weather and uneasy alliances between pirate crews. Although part of the Sea of Thieves vision is that while out at sea, other ships mean real encounters with other crews, we still see an opportunity for fortifications that can be raided as part of Voyages or on the way to another destination. In the future, these may be crewed by AI threats or even taken over by real players, and while players will eventually face dangerous AI threats at sea, we believe that the distinction between the creatures that they encounter versus real players on their own ships is both desirable and provides the right balance of PVE and PVP. Rather than having a replacement for everything a player can provide, our goal is to make the most of what real people and AI can uniquely offer to this experience. When players see another ship in the world, our desire is for it never to result in a one-dimensional story or a belief that the tables can never be turned. We never want to lose that sense of unease when spotting another sail and choosing the next course of action, whether that be confrontational or not. Different crews, each with their own ship, each on their own adventure, facing PVE threats and challenges as they embark on their own Voyages, but all with the chance of coming across other ships in the world and knowing that it’s a real, unpredictable encounter. This clear contrast between rich PVE scenarios and PVP encounters in the same shared world is at the very core of this game. That is what Sea of Thieves is. Of course, we already have some NPCs in the game at the Outposts and while at the moment these are fairly functional in terms of their purpose, it’s an area where we intend to expand in the future. We’ve spent a great deal of time thinking about the lore of the game, what the world of Sea of Thieves represents and how NPCs and players fit into it. We called the settlements Outposts because they represent little pockets of civilization in a hostile pirate world which is yet to have its golden age. With this in mind, we like to think of the Sea of Thieves as a place where would-be seafarers and pirates come to live out its promise of riches and untold adventures. This basic premise will be reflected in our NPCs with they themselves having come to the Sea of Thieves to stake their own claim and follow their own motivation Also, much like players, NPCs will come and go and rise and fall in influence as part of an ever changing world. As the origin of our Voyages, players will encounter groups of NPCs that represent different ways of play. 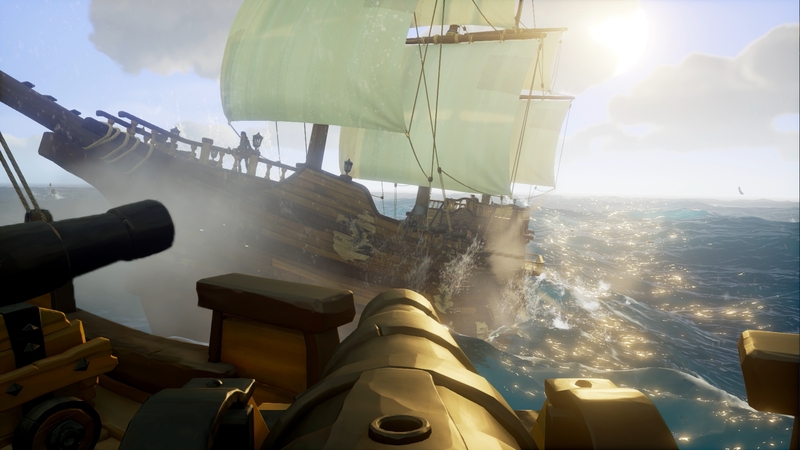 Whether longer term you want to play Sea of Thieves as a lone explorer, a merchant, a black market smuggler or whatever else feels appropriate for this world, our aspiration to continue building Sea of Thieves with the community means that we can add additional content and areas of progression in an order that ensures maximum value to players. Even if you’re a crew that favours predominantly PVP or PVE, our NPC’s will be the gateway to progressing in these areas as part of the future progression plans. In summary, our goals involve expanding both the PVE and PVP elements of the game, making them richer through Voyages, but also ensuring that our NPCs get an expanded role. Rather than what is typically experienced alone in games, such as PVE style gameplay or more PVP focused multiplayer, we see the potential of Sea of Thieves being in merging both, all while allowing players to follow their own motivations based on being in an immersive shared pirate world. We’ll use NPCs as an important part of the player’s goals but where we can, we’ll ensure that players can roleplay as part of separate roles that enrich the world. Some NPCs may very well provide the player with Voyages, based on their importance, with some groups being more permanent while others move on more frequently. That’s the aspiration of course. It relates quite closely to the progression work on-going at the moment. As soon as we make good progress, we’ll share more on this and the progression systems in general. When I mentioned that the ‘Golden Age’ is yet to come to the Sea of Thieves, what I mean is that we don’t want players to feel like they’ve arrived too late and missed the best bits. All that is still potentially to come and players (all of you) will have a hand in that as the Sea of Thieves evolves and gets richer over time. Players will play a role in the lore of the world. Then there’s the fact that there is no alpha yet for PC, only Xbox One. In September 2016, Executive Producer Joe Neate clearly stated that Rare didn’t want the game to feel unfinished or buggy, so it’s not unreasonable to think about a substantial delay from the original schedule. It would also be what’s best for the game, in all likelihood, but on the flipside it may be a problem for Microsoft’s already skinny roster of exclusive games. Either way, we’ll know more about the status of Sea of Thieves in less than two months at E3 2017. In the meantime, if you’ve signed up for testing on Xbox One you’d better check your inbox as 28K new invitations were just sent for next Saturday’s alpha play session.